"You don't know what dreams are any more." The clash of cultures is a common theme in Australian director Peter Weir's films. Whether it is the individuality of one man against an institution as in The Truman Show, modern American society up against a strict Amish religious sect (Witness), or civilized man trying to conquer the Amazon jungles (The Mosquito Coast), playing off the inherent conflict of ideas and morality is essential to a Weir film. His first major work, 1975's Picnic At Hanging Rock, pitted the repression of a girl's boarding school against the untamed rawness of nature. His next film, The Last Wave, contrasts the law of the civilized society with that of aboriginal tribal custom. The weather has been unusual for Australia; huge hail stones fall from a cloudless sky in the outback, and Sydney is deluged by unseasonal rainfall. After an altercation, a group of aborigine men stand accused of manslaughter when another member of their race is found dead. At first, it looks like an open and shut case, when David Burton (Richard Chamberlain), a corporate tax attorney, becomes inexplicably pulled into a criminal trial as the legal aid lawyer defending the group, but there could be complications. Officially, the victim died from drowning, but the exact cause of death is ambiguous. Burton begins to suspect there is more to the case than his uncooperative clients are willing to admit—and the dreams he has been having recently are stirring his imagination, one of which is an image of an aborigine offering him an artifact inscribed with a talisman. The dream is personified when Burton meets Chris (David Gulpilil), the same man who had appeared in his dream. Charlie (Nandjiwarra Amagula), an elder, further adds to the confusion, awakening more mysteries about the aborigines and Burton's own past. As the line between the conscious and unconscious begins to blur, so does that between civil and tribal law, even though there have been no tribal aborigines in Sydney for decades—or have there been? As he digs deeper into the world of aboriginal culture, Burton may find his life has gone down a path that is now inescapable; where reality and the "dreamtime" become one and the same. Those who enjoy Weir's previous film, Picnic At Hanging Rock, will find the same ethereal and unresolved quality in The Last Wave. However, this is a much darker film; gone are the lush greens and elaborate Victorian architecture. Instead, we have a world under seige by the heavens, as torrential rains darken the Sydney skies. Much of the film takes place at night, adding to the sense of mystery of things lost in the darkness. Very surreal in nature, The Last Wave drifts between worlds until there is no delineation between them. A sense of unease is prevalent, as the main character uncovers the truth about what has been occuring—but is it really the truth? For The Last Wave, Weir cast authentic tribal aborigines—a feat almost unheard of—who agreed to the job after Weir had assured Nandjiwarra Amagula, a real life elder and magistrate in the remote Groot Island community, that attention would be paid to cultural details, such as the importance of tribal law. David Gulpilil, who came to attention in Nicolas Roeg's Walkabout (1971), is credited here simply as Gulpilil, and plays the intermediary between the old world culture and that of modern society. Richard Chamberlain plays the part of the confused barrister with a mix of awe and foreboding at the apocalyptic visions he is presented with. Those looking for tidy answers had best steer clear—this is a film that makes its audience work to extract a meaning, to put together the pieces, and come up with their own conclusions. The style is classic Weir. The cinematography is magnificent, handled by Russell Boyd, who has collabrated with Weir on Picnic At Hanging Rock, The Year Of Living Dangerously and Gallipoli, and while some have criticized it, I found Charles Wain's score to be extremely effective in its blend of Tangerine Dream-like electronic music with traditional digeridoo, which will test your sound system's low-end response. The effect of the film is haunting, and as one of the only Weir films I had not previously experienced, it was a pleasant surprise on first viewing. While sure to frustrate many in its ambiguous and perhaps somewhat pretentious nature, this still is a very welcome addition to the Criterion Collection. Recommended. Image Transfer Review: Image quality is nothing short of stunning, and extremely filmlike, with a soft, fine grain, save for one scene near the end where grain is more pronounced. Colors are vibrant when appropriate, subdued when called for. The film is very dark by nature, but holds up well here, with decent shadow detail. Black levels are solid, and there is a good contrast balance. Print quality is excellent, especially compared to the trailer, which exhibits far more coarse grain. No evidence of compression artifacts, though the layer change was a bit rough on my copy. It should be noted that while the film had a theatrical ratio of 1.85:1, this disc opens the mattes slightly under Peter Weir's supervision. This is one beautiful transfer. Audio Transfer Review: Whoa! Those of you who figure that the only way to get your subwooferbusy is with a 5.1 track should drop this disc in. My theater room wasliterally shaking from the 2.0 soundtrack. Needless to say, the audiohere is extremely impressive, delivering a wide, full frequency spectrumthat will be felt as much as heard. The use of subsonics is substantialin many places, and the rendering of the digeridoo is excellent.Dialogue is for the most part easily discernable, with a few areaspurposefully ambiguous. A somewhat hidden 5.1 track is also included, accessable only during theplaying of the film from the audio options on the remote, with noselection from the main menu, and only minor mention on the packaging,which I completely missed at first. The sound quality is equal to the2.0 track except it is slightly louder, and the surround channels areonly really utilized for the score, with the main soundtrack sticking tothe front channels. Extras Review: Extras are limited the film's theatrical trailer and a 10m:41s interview with Peter Weir, which while very informative, feels overly short. Weir discusses how he managed to convince the tribal aborigines—who would normally never participate in any form of acting—to appear in the film, and how their influence affected what he put on the screen. Discussion also covers Weir's idea behind the story, as well as some of the locations used in the film. A short essay is included on the insert. Foresaking the golden hues that permeate Picnic At Hanging Rock for the blue-grey foreboding of apocalyptic events in Sydney, The Last Wave bridges the future and past as Richard Chamberlain confronts the traditions of a tribe of aborigines. The dark atmosphere and unsettling musical score add to the film's sense of impending malevolence and mystery. 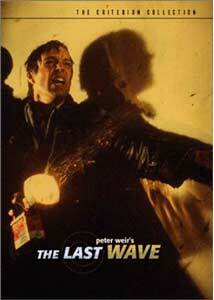 Weir's penchant for the enigmatic may not sit well with some audiences, but for a film that will leave you questioning what you have seen when the lights come up, The Last Wave is an impressive work that deserves to be seen. Criterion delivers another solid release, though perhaps a bit light on the supplements for such a remarkable film.